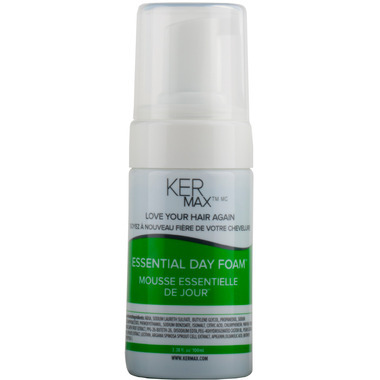 Kermax Essential Day Foam was formulated and manufactured in France with the exclusive “KerGro 3X-a™” formula that combines the power of nature – fruit stem cells, peptide amino acids and botanical extracts in an advanced cosmetic technology delivery system. Helps stimulate follicles to reduce or stop the appearance of hair loss. Helps fine, thin hair appear fuller, thicker. Helps promote scalp and follicle health for potential hair regrowth. Apply every morning to dry or damp hair on targeted scalp areas. Gently massage with fingertips until foam is fully absorbed. Style hair as desired. Stays active even after blow-drying or heat styling. Safe for permed or treated hair. No residue is left behind.